Pakistan's federal government has also been critical of the strikes, calling them a violation of the country's sovereignty and saying they kill too many civilians. A suspected U.S. drone strike killed an alleged militant in Pakistan's northwest tribal region, intelligence officials said Friday, the latest indication Washington has no intention of throttling back its unmanned aircraft attacks despite increasing tension with Pakistan over the attacks. The overnight strike targeted a house in Qazi Kot village in the North Waziristan tribal area, said Pakistani intelligence officials, speaking on condition of anonymity because they were not authorized to talk to the media. A suspected member of the Punjabi branch of the Pakistani Taliban was killed, they said. The attack came a little over a day after a Pakistani political party revealed what it said was the name of the CIA's top spy in the country and called for him and the head of the agency to be tried for murder for a recent drone strike. The party, Pakistan Tehreek-e-Insaf, has also been trying to block trucks carrying NATO troop supplies to and from neighboring Afghanistan to protest drone attacks. Pakistan's federal government has also been critical of the strikes, calling them a violation of the country's sovereignty and saying they kill too many civilians. That has made the attacks widely unpopular among the Pakistani public. But the prime minister, Nawaz Sharif, has shown little interest in sparking a crisis with the U.S. over drones. The issue is also clouded by the fact that Pakistan's government and military is known to have supported at least some of the strikes in the past, and suspicion lingers that some level of complicity continues — although Islamabad denies the allegation. 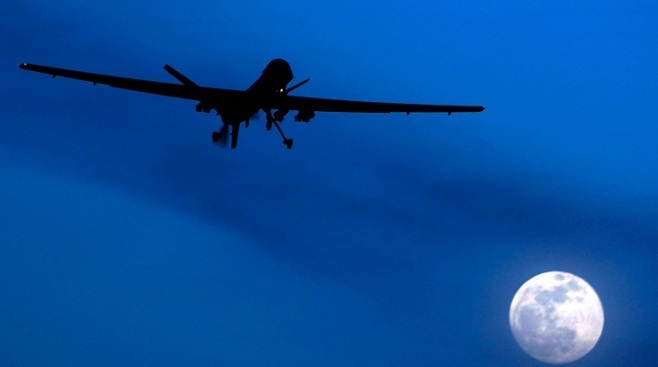 The U.S. rarely discusses the covert CIA drone program in Pakistan in public. But U.S. officials have made clear that Washington views the attacks as a vital tool to target al-Qaida and Taliban militants in Pakistan who are outside the reach of American soldiers. The CIA has not confirmed whether the name revealed by Pakistan Tehreek-e-Insaf on Wednesday is actually the agency's station chief in Islamabad. It was the second time in recent years that Pakistanis opposed to drone strikes have claimed to reveal the identity of the top CIA spy in the country. In December 2010, the CIA pulled its top spy out of Pakistan after a lawsuit accused him of killing civilians in drone strikes. The Pakistani lawsuit listed a name lawyers said was the station chief, but the AP learned at the time it was not correct. Nevertheless, the CIA pulled the station chief out of the country after militants threatened to kill him. The drones have been a complicated issue for Pakistan's powerful army chief, Gen. Ashfaq Parvez Kayani, during the six years that he has led the force. The army held an elaborate ceremony Friday marking the end of Kayani's time as chief and the elevation of his successor, Gen. Raheel Sharif. The culmination of the ceremony in the garrison city of Rawalpindi included Kayani handing over a wooden baton symbolizing the change of command. The army is considered the most powerful institution in Pakistan, which has experienced three military coups, and Kayani has played a hugely influential role in the country. However, unlike many of his predecessors, Kayani was publicly adamant that the army should not overtly interfere in politics. That stance allowed Pakistan to experience its first successful transition between democratically elected governments earlier this year — although the army has continued to play a powerful political role in the background, especially regarding policy toward the Afghan war and Pakistan's archenemy India. Retired army officers have said they expect the new army chief will largely continue the policies of his predecessor. Kayani was a critical figure for the U.S., which relies on Pakistan for support in battling Islamic militants and negotiating an end to the war in Afghanistan. The U.S. was initially heartened by Kayani's appointment as army chief in 2007 because of his stated desire to stay out of politics. But the relationship between Kayani and his U.S. counterparts eventually deteriorated, especially following the covert American raid that killed Osama bin Laden near Pakistan's equivalent of West Point in 2011. Kayani and other officials were outraged by the operation because they were not told about it beforehand. The relationship also faced constant strain because of U.S. allegations that Pakistan's army supported Afghan Taliban militants staging attacks against American troops in Afghanistan. Pakistan denied the allegations, but analysts widely believe the country has maintained its historical ties to the militants because it views them as potential allies in Afghanistan after foreign forces withdraw. Kayani also faced a vicious insurgency by domestic Taliban militants that killed thousands of security personnel and civilians. The Afghan and Pakistani Taliban are allies, but have generally focused their attacks on opposite sides of the border. Kayani launched scores of operations against the Pakistani Taliban in their sanctuaries in the northwest, but the attacks have continued. He refused U.S. demands to target their final sanctuary in North Waziristan, a move that analysts say was driven by his desire not to cross Afghan militants based there with whom the army had ties. The government recently tried to jumpstart peace talks with the Pakistani Taliban, but the effort was torpedoed by a U.S drone strike at the beginning of November that killed the group's leader.